Baby strollers are necessary if you need to get around town with your baby. 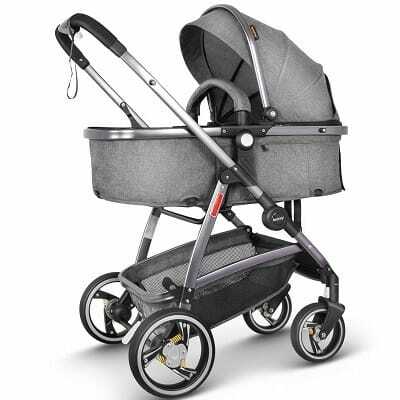 Convertible strollers are the best option for moms and dads on the go. 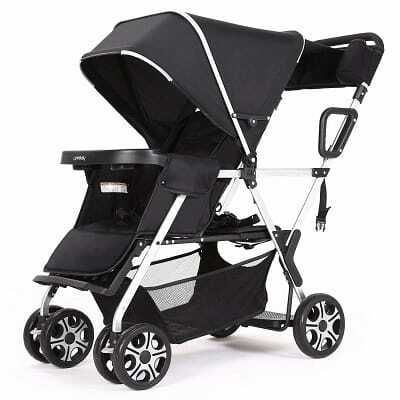 A convertible stroller is a frame that comes with a baby carrier you can use as both a car seat and a stroller base. A convertible stroller also allows you to attach a second seat, bassinet or even car seat to make it a double stroller for 2 babies. This is really helpful if you have an older child who says she prefers to walk, but gets tired and changes her mind. Strollers can be of various types – two baby stroller, convertible double stroller, single strollers that convert to double, and so many more. So if you are looking for the best convertible strollers for your baby, we have got you covered with this list! Take your twins on a lovely trip, be it a walk through your neighborhood or on a long drive! Baby Trend Stroller is a two babies’ stroller that you can convert into car seats. 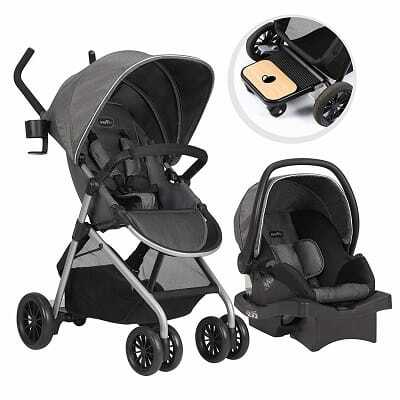 This is convenient for parents who need to drive a lot.This sturdy baby stroller for two is a double delight when it comes to style, safety, and simplicity. It is perfect for kids weighing up to 35 pounds and 30 inches tall. Trend Sit N’ Stand Double Infant Stroller has two seats or a detachable back seat that you can convert in many ways. This makes it very suitable for restless kids who can sit, stand, or even sleep in this comfortable convertible stroller. Ideally, the elder child can stand on the rear platform and keep an eye on the smaller baby for you. Isn’t that great? Has a parent tray for phone, keys, shades, etc. and cup holders for drinks. Why will you like this? Often busy parents can be overwhelmed with choices when shopping for a convertible baby stroller. So, choosing a stroller and car seat at once is a great time saver. This two-in-one concept is a great space saver too! This stroller turns into a tricycle as your baby grows up. It is here to stay with you for a long time and make your outdoor activities fun! It is lightweight yet made of durable, long-lasting steel. It is easy-to-use, and convenient for parents. It has many safety and smart features. This helps parents move it around for infants while the older kids can peddle the tricycle on their own fearlessly. It can carry a maximum weight of 55 lbs. And is ideal for kids of 18 months and above. It comes with ASTM F963, CPSIA Certifications. This baby stroller requires some assembly. This stroller is high on safety, quality, and durability. The blue color is appealing as well as soothing. This luxurious Convertible Baby Stroller doubles up as a pram/baby carriage/pushchair/sleeping basket. It is a stroller that can hold the baby in two positions: sitting and sleeping. This stroller is extremely convenient for parents. This is a combination that can stay with the baby from birth up to 3 years. It can carry a maximum baby weight of 33 lbs. It has a rain cover, bottle holder, and an instruction booklet. Adjustable backrest for sitting mode and 5-point safety belt for night movements. It is a compact stroller, and it has vents in the basket for air flow. If the baby is too sleepy during a stroll, it can be quickly converted to a sleeping mode. This stroller is a single to double stroller with a removable full-size rear seat. Once that is removed, it becomes a single stroller. You may of course still have your older child of maximum 2.5 years to sit at the rear bench or stand on the rear platform. As a double stroller, the full-size back seat with a three-position recline can accommodate a baby from 6 months to 45 lbs and the front seat can hold an infant from 3 months to 45 lbs. The total maximum child weight on the stroller can be 90 lbs. The stroller has a universal car seat adapter. There is a large front canopy and also a rear canopy for the child in the back. This baby stroller weighs around 21 pounds without the rear seat and approximately 23 pounds with the back seat. 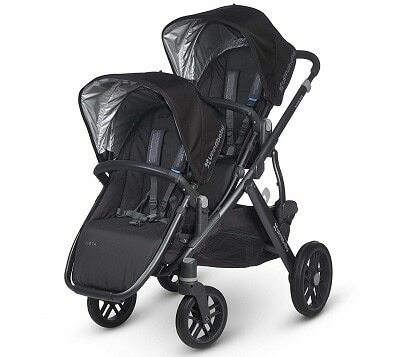 Single strollers that convert to double like this one is much easier to use than side-by-side strollers. They save road space, home space and loads of your energy and time. This versatile Stroller includes a Bassinet and 2 Toddler Seats. This stroller can multitask with many babies, maybe even three and in many positions. The fresh design of the Rumble Seat allows the kids to face backward, forward and even recline. The seats are super expandable, and convertible seats have a variety of options like two MESA infant car seats, two bassinets and so much more. This stroller has so many options. This stroller is excellent for a family with lots of babies, especially joint families. This is the 2018 model of VISTA strollers. This Baby Stroller is high on quality, style, durability. It gives a super smooth and comfortable ride to the babies. It is also convenient for the parents who are behind the wheels. It also comes in several color options! It has a full-size front or back facing toddler seat with versatile recline. You can directly fit it with MESA Infant Car Seat without any adapters. The bigger mattress pad is well ventilated for baby to breathe easy. 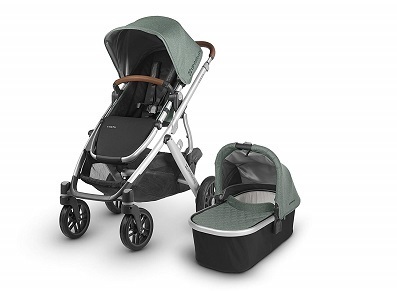 Parents will love the single-step folding with or without the seat. It can hold a max of 50 lbs. 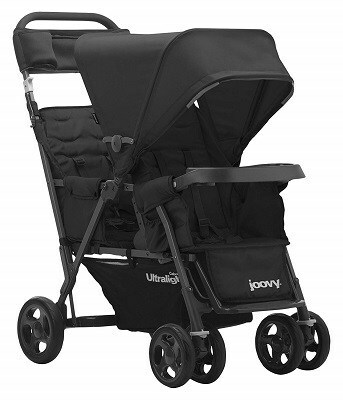 This Convertible Stroller has super spacious storage that can be accessed easily and can store up to 30 lbs. This Convertible Stroller is excellent for a three-baby family and maybe more! Even grandparents can use it due to its ease of movement. 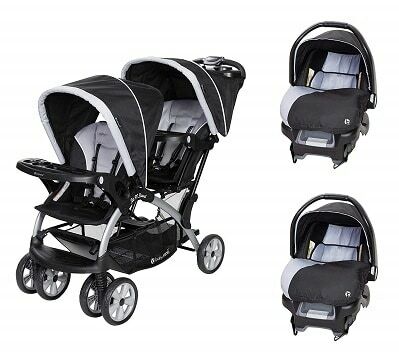 This single to double stroller is ideal for one baby and one much older child. It is a 2-rider stroller with a Ride-Along Board that allows the older child to stand behind. It also has a the LiteMax™ 35 Infant Car Seat included. It has a large, 3-panel canopy, baby head pillow, and peep in the window to check on the baby from outside. The stroller can take a maximum weight of 50 lbs. The LiteMax™ 35 Infant Car Seat has secure, one-click installing option, integrated belt lock-in system, many-position base and recline indicator for optimum security in this single to double stroller. This stroller is ergonomically-designed for comfort and ease-of-use for parents. The lightweight car seat can be easily carried in your arms. This two babies stroller allows both standing and sitting position for the older baby. So, while the younger baby is tucked into infant carriage, the older one does not get tired by just standing and can also get sitting breaks. 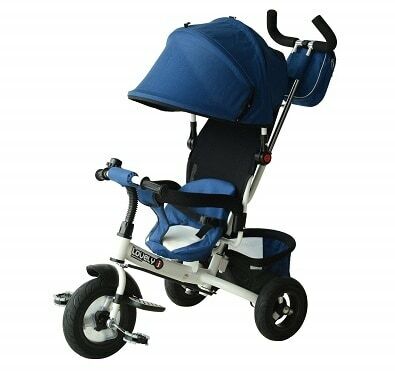 It can run in many types of terrains and is a unisex stroller. The front carriage is ideal for 3-month old infants, and the rear seat or standing platform is best for 2.5-year- old kids. It offers a Lifetime warranty with 100% full money back policy if you wish to return it. It also has ample storage for parents, 145-degree movable front seat canopy and rear seat canopy is included too. This stroller tray doubles up as a food plate, and there are cup holders for your baby’s drinks. It weighs 21.5 pounds, and some parents may find it heavy. It allows the older child to both sit and stand, giving some rest to their tired legs if mommy is out with many errands. This two babies’ stroller can be taken anytime, anywhere with its all-terrain system. With these vast options to choose from, you should keep in mind your personalized requirements when you take your pick. Also, bear in mind your baby’s size, your daily schedule, and your home and car space. We may be missing some of the considerations, so keep a pen and paper handy and jot down everything. Do your research before you invest in your baby’s travel buddy.